All Christians dread the desert stretches of the spiritual life -- those times of emptiness, seeming meaninglessness, and aching loneliness. We trudge on, with no destination in sight, no tracks to follow -- and heaven is silent. Yet the desert, says bestselling author and experienced disciple Dr. Pamela Reeve, can be the place where we meet God in a new way, a place where He woos us freshly to Himself. God has purposes for the desert days that can't be learned anywhere else -- His goal is our transformation. Pam Reeve's poignant lessons from life's wilderness experiences combine with color photography in a unique product that is both keepsake and gift book. In her own unique and beloved style, Reeve provides water for the dry, dusty days spent wandering -- and learning -- in the Lord's desert. - Publisher Reeve writes that the spiritual desert all Christians must go through can be a place to meet God in a new way. God has purposes for the desert days that can't be learned anywhere else; His goal is our transformation. Her poignant lessons from life's wilderness experiences combine with color photos in a unique product that is both a keepsake and a gift book. - Publisher There you are, trudging along with no visible destination, no tracks to follow. These lonely "desert days" often leave us feeling spiritually parched. But the seemingly meaningless times are often when we encounter God in new, transforming ways. Dr. Reeve's poignant life lessons combined with beautiful color photography will provide an oasis for your soul. 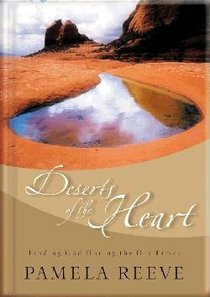 About "Deserts of the Heart"
Reeve writes that the spiritual desert all Christians must go through can be a place to meet God in a new way. God has purposes for the desert days that can't be learned anywhere else; His goal is our transformation. Her poignant lessons from life's wilderness experiences combine with color photos in a unique product that is both a keepsake and a gift book. There you are, trudging along with no visible destination, no tracks to follow. These lonely "desert days" often leave us feeling spiritually parched. But the seemingly meaningless times are often when we encounter God in new, transforming ways. Dr. Reeve's poignant life lessons combined with beautiful color photography will provide an oasis for your soul. Dr. Pamela Reeve is a popular author, conference speaker, and adviser and professor at Multnomah Bible College and Seminary in Portland, Oregon. When she was a new Christian and a recent graduate in architecture from New York University, she took a lifelong vow of celibacy. Soon after, a pastor challenged her to go into full-time ministry, forsaking professional advancement in the field she loved. From a thriving ministry as principal of a Christian high school in Southern California, God led her next to Multnomah, where she served as dean of women for twenty-three years.